Lacking a dance floor or even disco ball, Kingsbury Hall might not be the most appropriate place to boogie to ABBA's cheesy disco, but, luckily, the seats are bouncy enough for some serious tush wiggling. 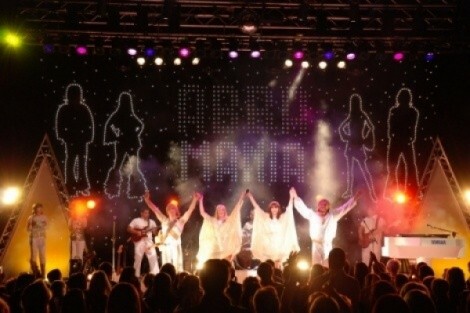 One of the world's finest cover bands, ABBA Mania, starts at 7:30 p.m. tonight. In 1980, the Babcock Theatre began it's 30 illustrious years of production. So, it must be time to celebrate. The Babcock Performing Readers will present highlights of past performances, while raising a toast to its founders, past presidents and actors, at the 30th Anniversary Gala tonight at the Little Theatre (200 S. Central Campus Dr.) at 7:30 p.m..
With a foot in bluegrass' past and chugging along in the present, The Blackberry Bushes round out the list of tonight's throwbacks. Led by Jes Raymond, the Olympia, Wa.-based Bushes' rootsy music can warm up anyone on the coldest pre-winter night—like tonight. Grab a brew as you tap your toes at Piper Down; music starts at 9 p.m.
Bar rock never sounded so good as with The Hold Steady, playing at In the Venue tonight at 7 p.m. While the band doesn't necessarily fit into my theme, think about it like this: While throwbacks are engaging because of an easy rapport as it's part of your history (like it or not), The Hold Steady's lyrical crooning is so easily digestible and enjoyable, it's like you've known the song's story and this band for so long. A stretch? Well anyway, you won't be disappointed. To round out tonight's lineup, head over the King's English to hear Bruce Machart read from his debut The Wake of Forgiveness. Read more here.